Capacitive level sensors are now available from RECHNER Sensors conforming to the requirements of NAMUR EN 60947-5-6, with analogue output for both ATEX danger areas: for Gas Zone 0 and Dust Zone 20. 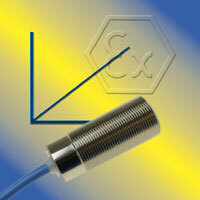 These Sensors are equipped with a current output of 20…4 mA or inverted with 4…20 mA. The body sizes available cover all standard sizes, i.e. M12 x 1, M18 x 1 and M30 x 1; for both flush and non-flush mounting. For the user, capacitive analogue sensors provide a big advantage where it is important to know, if there are changes with the product to be detected; for instance, the mixing ratio or the distance.